Governors Island family Compound that surpasses excellence. Built in 2007 this four bedroom main home has over 5400 square feet of outstanding living space plus a four bedroom guest home with over 3400sf of fabulous living space. 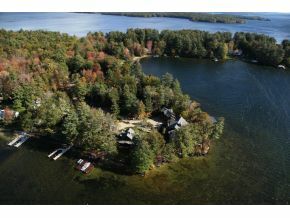 Outstanding docking, sandy beach, incredible views, level lot, patios, two homes, two lots with 566 feet of crystal clear waterfront"¦this is a rare find. Quality built by master builder, Skiffington Homes, you will be impressed by the style and amenities. Elevator, wine cellar, billiard room, fabulous baths, private bedroom suites, exercise room, post and beam porches with fireplace, five garages are just a sampling of the amenities at this impressive property. The lot is level, the location is prime. This is a prize in the community of Governor's Island. 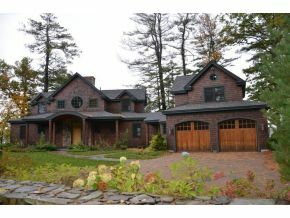 Listed by Coldwell Banker. Governors Island is one of five bridged islands on 44,000 acres Lake Winnipesaukee and is part of the town of Gilford, New Hampshire. The island supports high end housing and cultural activities. From your boat you can port in Meredith for breakfast and then head over to Wolfeboro for some shopping and swimming and end the day in Center Harbor at one of my favorite restaurants Canoe. In the evening you can enjoy a music at Meadowbrook an outdoor Concert Venue located in Gilford. Prior to a day of tubing and water sports on the lake Winnipesaukee get out early morning or late afternoon for some of the best salmon and lake trout fishing in New England. In the winter you can be on the slopes of Gunstock Ski Area in less than 15 minutes or by snowmobile follow your same summer route on the lake or up into the White Mountains.